Halloumi definitely goes on the list of things that I wish I’d known about earlier. It just compliments everything I put it next to. Try these Halloumi And Veggie Wraps on for size. 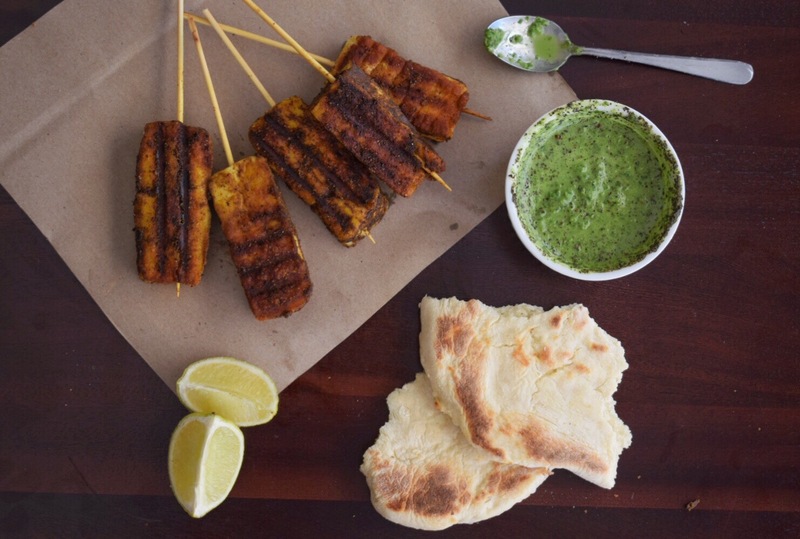 Then come back and make this recipe and try and tell me that halloumi is not magical. I have many things planned for this salty cheese in the future but let’s talk about the NOW. Halloumi has long been criticised for becoming rubbery and unpleasant when cooked. Not that I don’t understand, I’ve experienced this firsthand. Do I have any magical tips for avoiding this? Of course I do, you know me. These are the 3 options most recommended by the Internet. Firstly, you could make your own halloumi. Whilst I’m not against homemade cheese, I don’t have 3 days to wait. The second option, which is more convenient, is to soak your cheese in cold water for up to an hour to get rid of some of the salt. The third option is to eat that cheese as soon as it comes out the pan! Don’t let your food get cold and you don’t have to worry about that rubbery feel. This is by far my favourite option because you don’t need to tell me twice to tuck into my food. That having been said, this recipe is no frills, no fuss. The instructions are as simple as the cooking time is short. If you’d like to turn up the heat then increase the amount of cayenne. 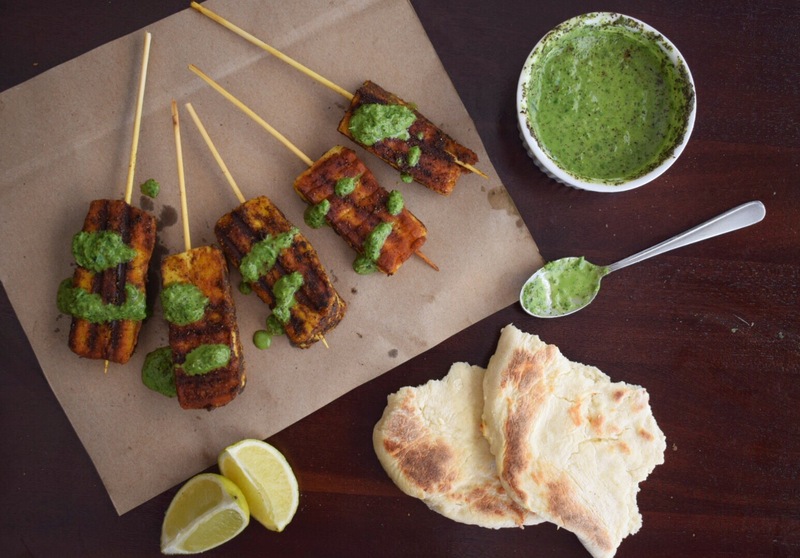 If you’re spice-shy then I’d suggest lathering the halloumi skewers in this simple mint sauce. Enjoy! 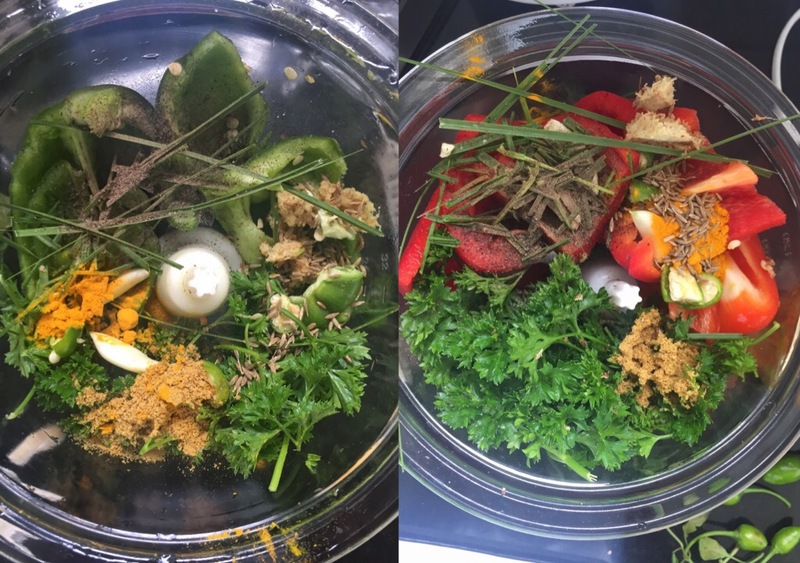 To make the mint sauce: combine all the ingredients for the mint sauce in a blender and pulse until combined. Store in a tightly sealed glass jar. Will keep in the fridge for 2 weeks. Start by carefully skewering the halloumi. Set aside. 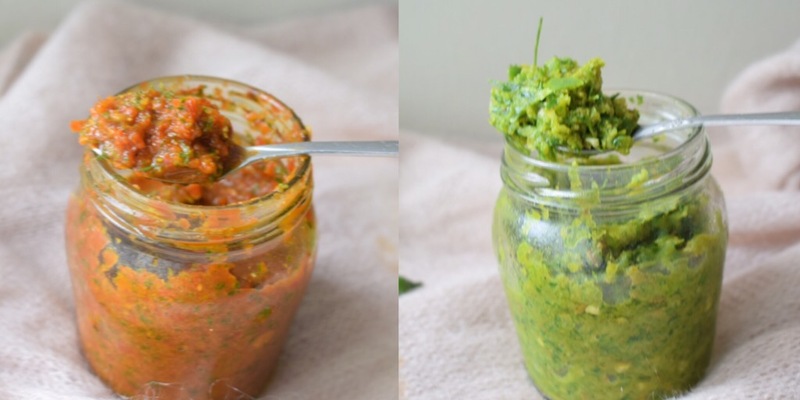 Combine the spices and olive oil in a small bowl and stir until it forms a thick paste. 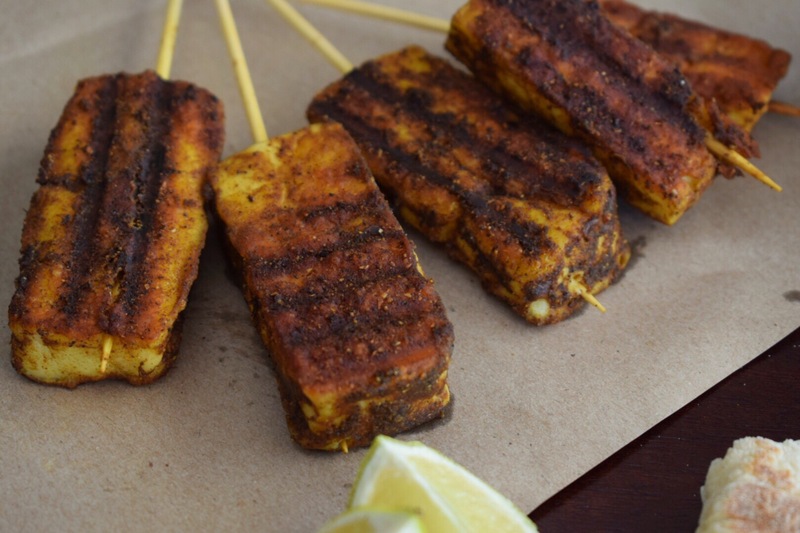 Coat the halloumi skewers in the tandoori spice paste. Heat a skillet on high heat and brush with some vegetable oil. Grill the skewers for 3 minutes on either side. 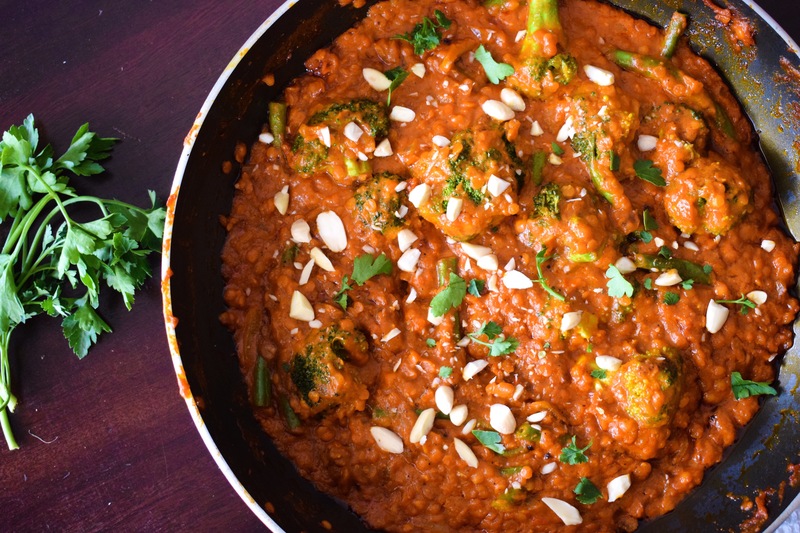 Serve with the mint sauce and some naan and yogurt to curb the heat! 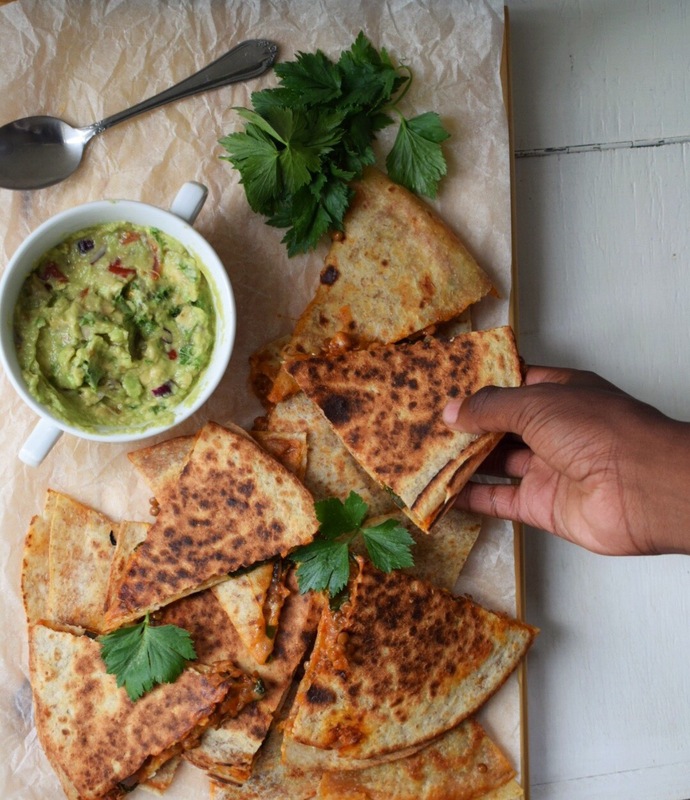 Today I bring you your latest obsession: these quesadillas. Being the only vegetarian in my household, cooking plant based meals that people actually enjoy has proven to be my toughest challenge. I’m perfectly happy eating a couscous salad but that wouldn’t please my rugby playing brother. My health conscious mother isn’t very comfortable eating starch-dense potatoes lathered in mountains of cheese and herbs (ugh heaven). 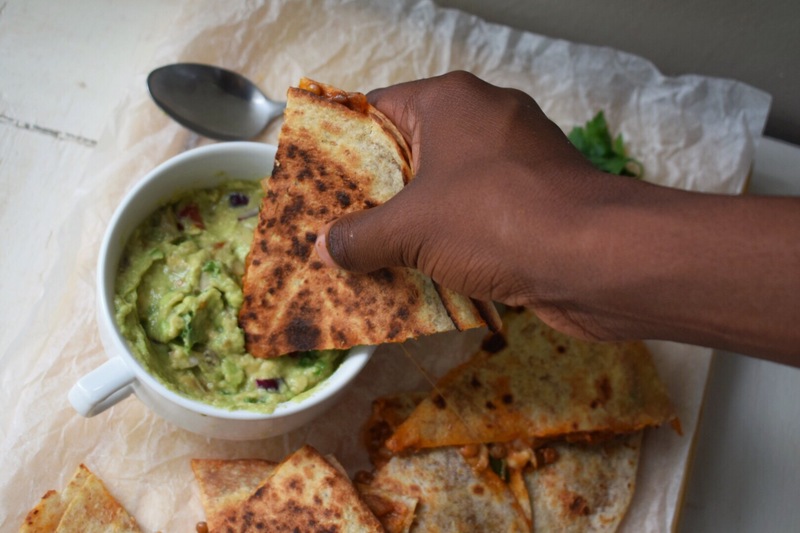 However, these quesadillas have finally cracked the code! 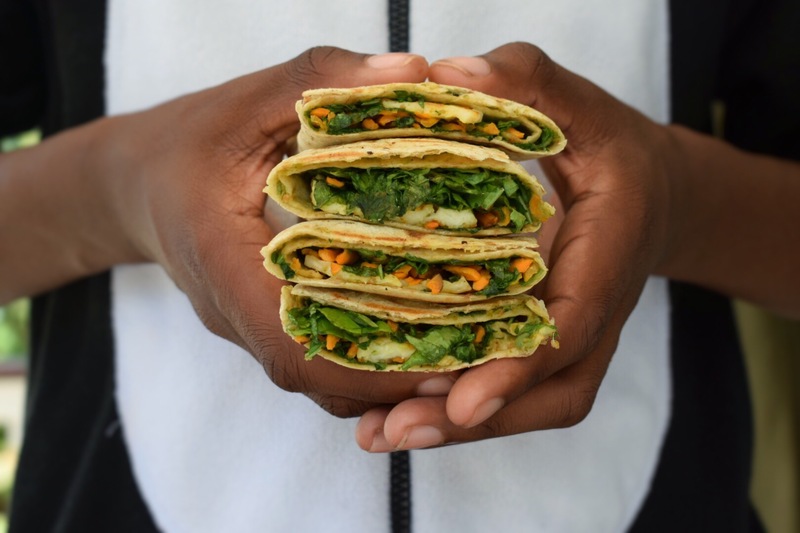 The crispy, cheesy quesadillas keep my brother from forgetting that there’s no meat involved, and the cheese-less version kept my mother from complaining about her waistline. It’s a win-win! These make the perfect chilled Friday dinner, weekend barbecue meal or even as a lunchbox staple. 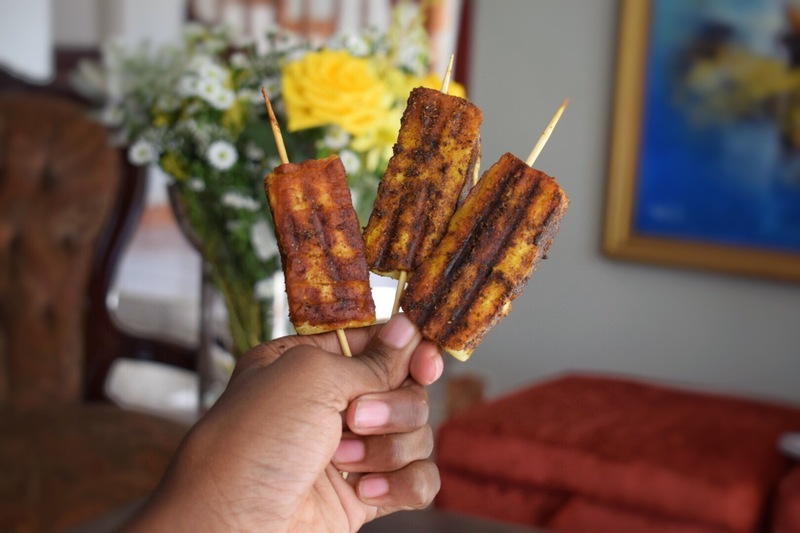 Do yourself a favour and make these this weekend for ultimate #weekendgoals. If you do decide to let quesadillas be a part of your life, make sure to let me know by dropping me an email, or contacting me through my Instagram or Facebook. Happy weekend lovers! Mash the avocado until soft. Combine with the rest of the ingredients in a small bowl and stir until the onion and cilantro are evenly distributed. I wouldn’t advise preparing this more than an hour in advance, but if need be, then lay a piece of cling film directly on the surface of the guacamole to prevent it from browning and store in the fridge until needed. Will not keep more than 2 days. Start by cooking the lentils. Add the dry lentils to a medium saucepan, cover with 2 cups of water (or vegetable broth if you wish) and bring to a boil. 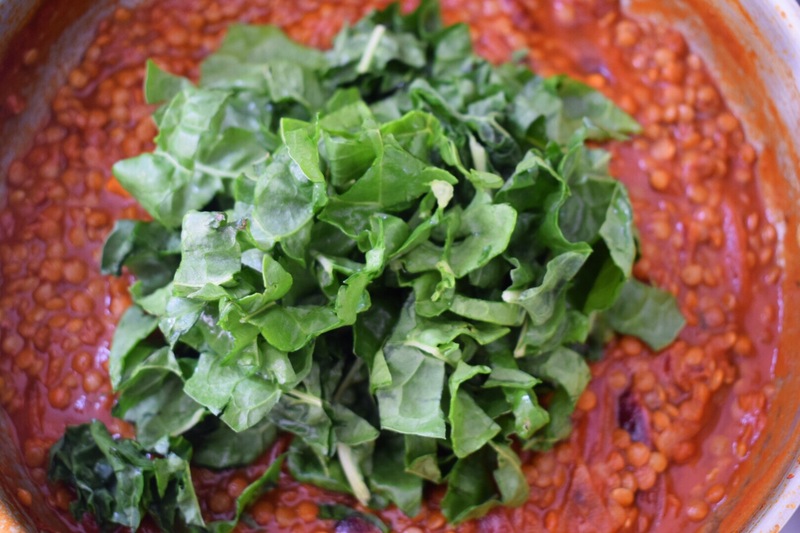 Reduce the heat and simmer for 15 minutes or until the lentils are swollen and soft. Meanwhile, heat some cooking oil in a deep cast iron pan and fry the onions on high until translucent, about 2 minutes. Add the garlic and cook until fragrant, about 30 seconds. Add the cinnamon, oregano and cumin and toss until the onion is coated in the spices. Pour in the tinned tomatoes and vegetable broth, season liberally with salt and pepper and bring the mix to a boil. Reduce the heat to low and allow to cook until the lentils are done. Chop the spinach into ribbons and throw it in a large bowl. Pour boiling water over the spinach and allow it to sit for 5 minutes. Drain and squeeze the spinach to get rid of all the water (be careful, it may still be searing from the hot water) and set aside. 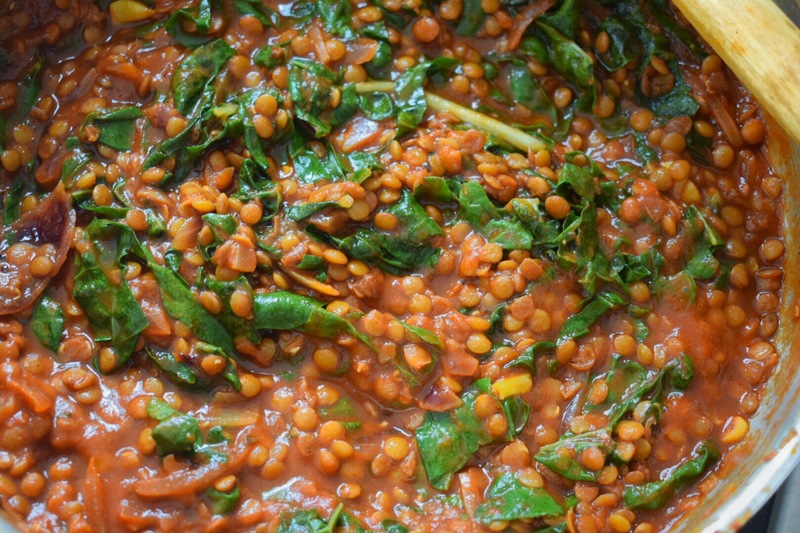 Once the lentils are cooked, add them and the blanched spinach to the tomato mixture and let cook another 5 minutes. Once the spinach has cooked down and softened, remove the pot from heat. It’s time to assemble the quesadillas! If non-vegan, sprinkle about ¼ cup of the mixed cheeses evenly on top of one tortilla, leaving about a one centimetre border. Top in a uniform layer with ¼ cup of the lentil spinach mixture, and finally another ¼ cup of cheese. Lay another tortilla on top and press down on the quesadilla. 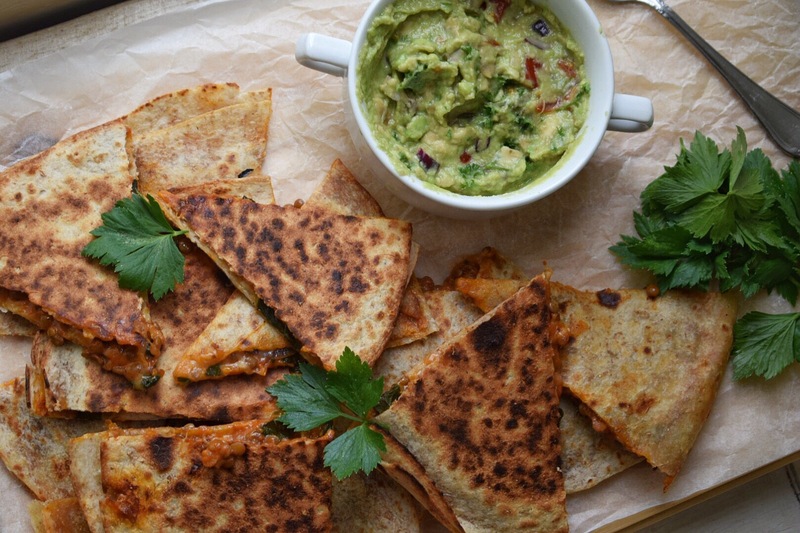 Repeat until you’ve used up all the tortillas and have 4 whole quesadillas. Let them rest for 5 minutes before cutting into quarters and serving hot! Serve with the guacamole and enjoy! Whilst I’m sure most of you are breaking out your gym shoes and stocking up on healthy foods to start the New Year Detox, I’m piling on the chicken and cheese because #newyearnewme is a lie and we know it. January 1st approaches and we all feel the need to make instant fleeting changes to our lives. My question to you all is why? Why wait until the calendar changes before you make a change? Why must the diet start on Monday? Why must your will to improve yourself depend on the Earth’s current position in its orbit around the sun? My message today: stop waiting. If you want to lose that extra 10 pounds, start now. If you’re not keen on joining but you feel pressured to do it because it’s what all your friends are doing: don’t do it. Stay at home, munch on these nachos, your wallet will be grateful. Your mind will be at ease 2 months later when they’ve all stopped going. Instead of feeling the need to reinvent ourselves every 365 days, let us celebrate the spirit of new beginnings and having the chance to make this year our own whilst staying true to ourselves. 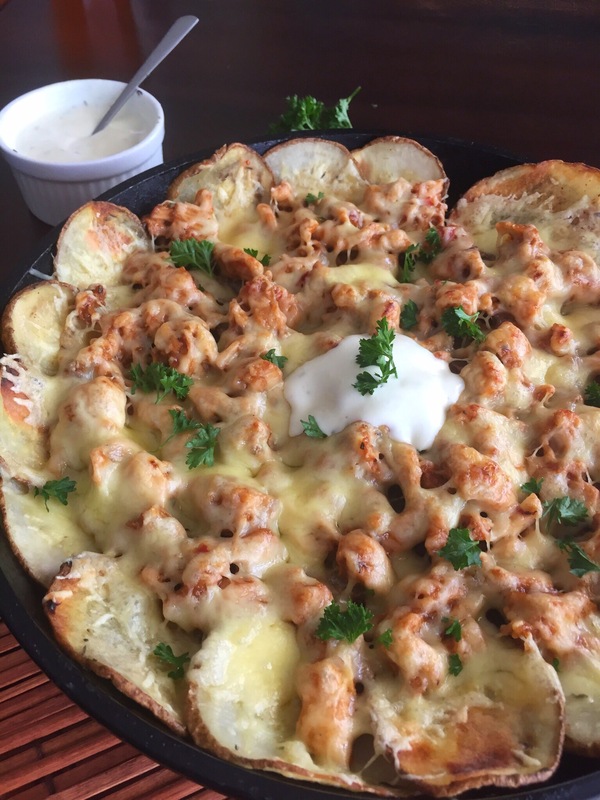 Given this, I decided that the first recipe I share with you this year will be these crispy potatoes topped with chicken tossed in a barbecue sauce all sprinkled with a mountain of cheese. YES. I’ve made this about 5 times already and I can’t get enough of it. Sometimes I eat healthy and sometimes I feel the need to drown myself in spicy rich unhealthy stuff. Today, I just happen to be in the mood for the latter. 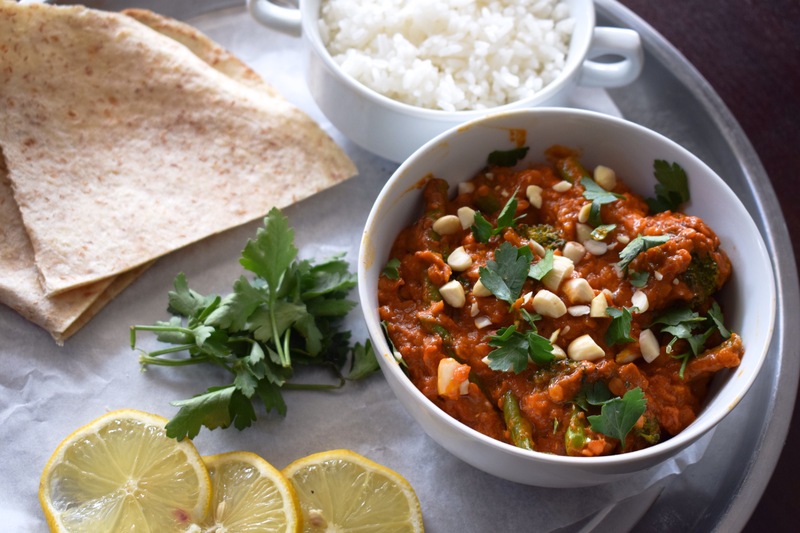 Start by combining all the ingredients for the spice mix in a small bowl. Whisk well to ensure even distribution of the spices throughout the oil. Set aside for use later. Preheat your oven to 180°C/350°F. Line 2 baking sheets with parchment paper and place the potatoes in a single layer. 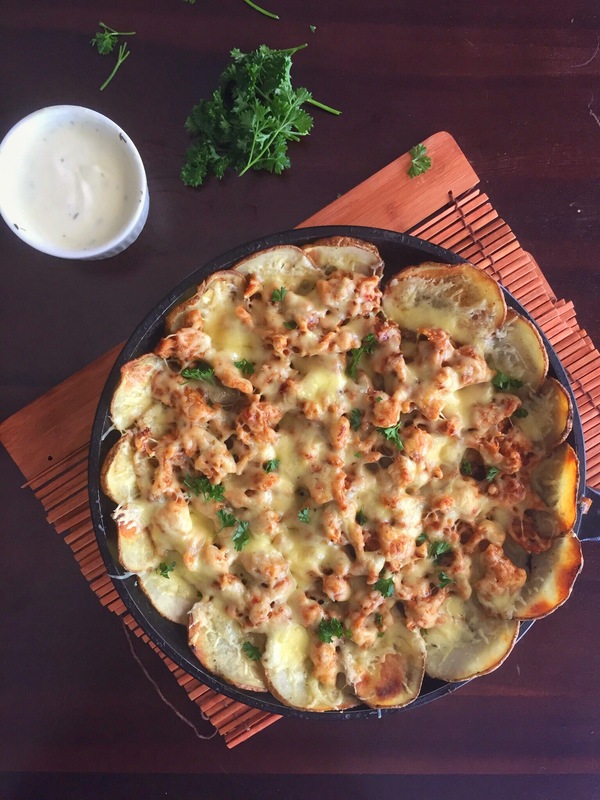 Drizzle the spice mix over the potatoes and bake in the preheated oven for 25-30 minutes or until golden brown and crisping up. Once baked, remove the potatoes and let cool. Meanwhile, prepare the chicken. 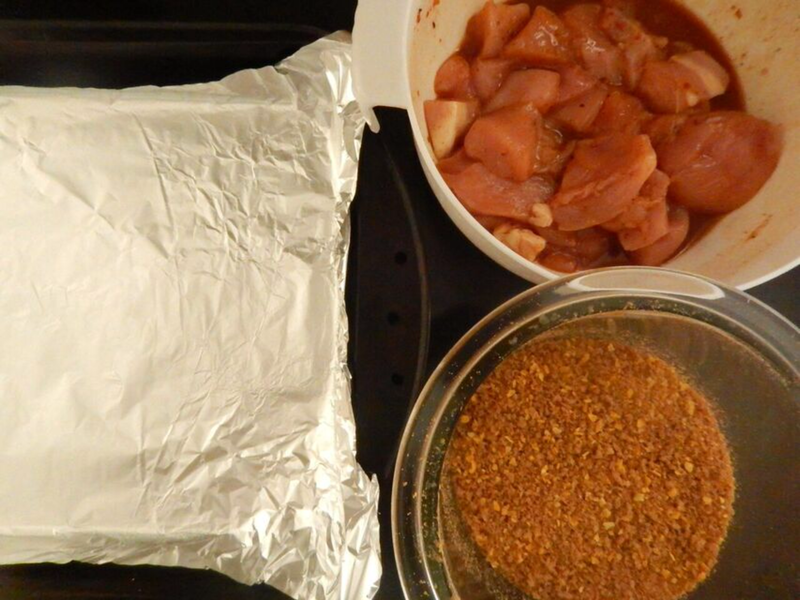 Add the remaining spice mix, brown sugar and mustard to the chicken breast meat and toss well to combine. Heat a large skillet on high and cook the chicken for 10-15 minutes or until no longer pink on the outside. Remove to a bowl and use 2 forks to shred. In the same skillet, add all the ingredients for the sauce and whisk until incorporated. Bring to a boil then reduce heat to low and let simmer 5 minutes, or until the sauce has thickened considerably and coats the back of a spoon. 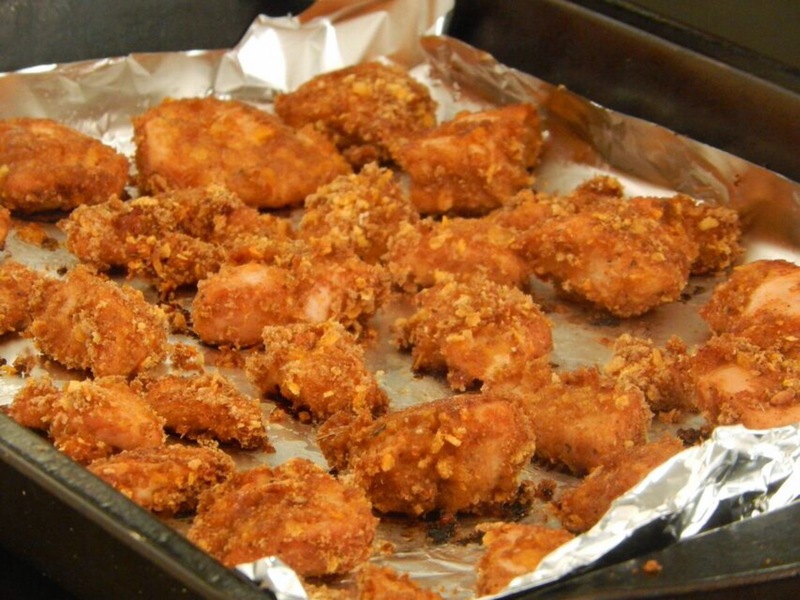 Return the shredded chicken to the skillet and stir until the chicken is coated in the sauce. Let cook for 2 minutes then remove to a bowl to cool. When ready to assemble, lightly grease a shallow frying pan/baking tray/Pyrex dish or whatever takes your fancy. I’ve tried this with all three and I’ve found that a frying pan works best for presentation. Preheat your broiler/grill. 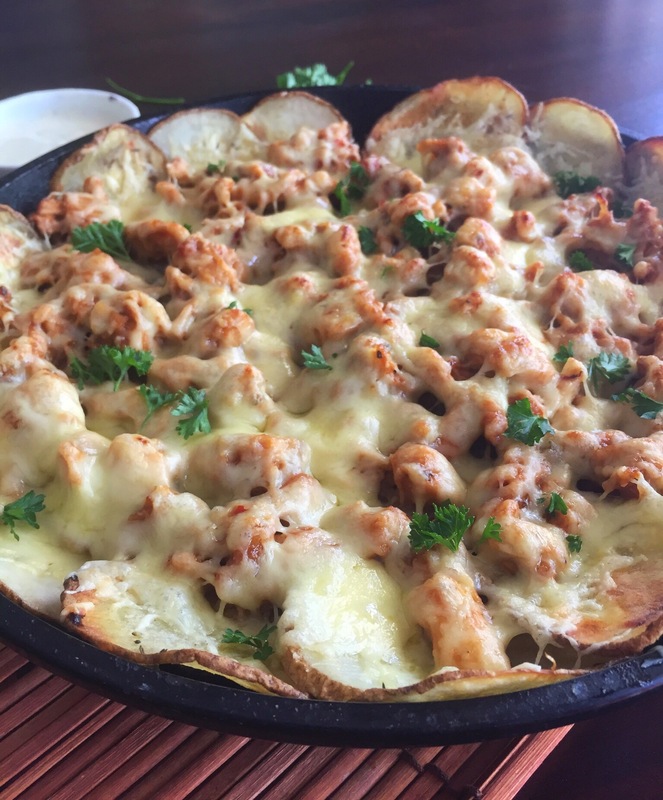 Layer the bottom with potatoes followed by the chicken and top with the grated cheese. Place the frying pan under the broiler/grill and bake for 5 minutes or until the cheese has melted. If you’d like your cheese to be browned (shoutout I see you) then broil for closer to 10 minutes. Top with the fresh parsley and enjoy! 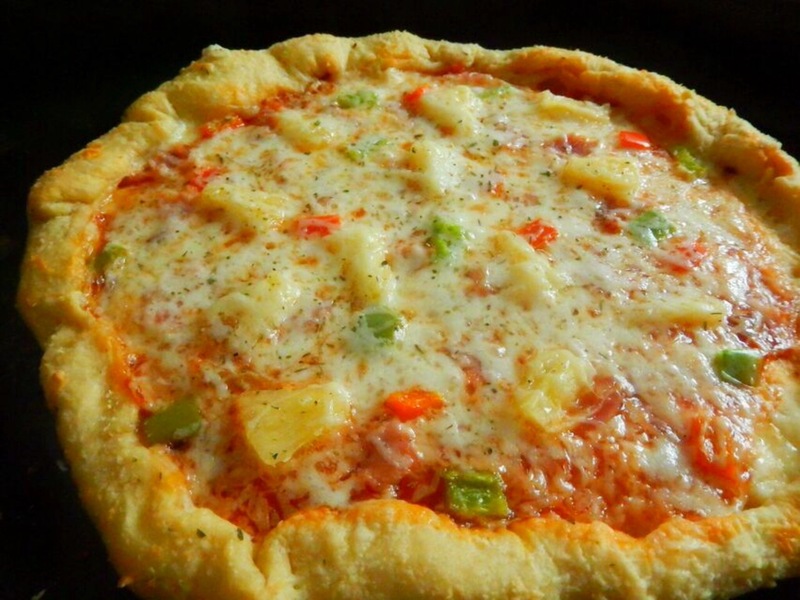 Fun fact: Hawaiian pizza does not actually come from Hawaii. It’s from Canada. Reason Number 2837 why everybody loves Canada. Remember how I talked in my last post about how pizza dough is superior to pizza? I may have lied. Don’t get me wrong, pizza dough is great, but it’s not pizza great. How do you beat this gooey cheesy mess piled on top of a spicy barbecue base, topped with crispy bacon and tangy peppers? Yes, you may worship me now. 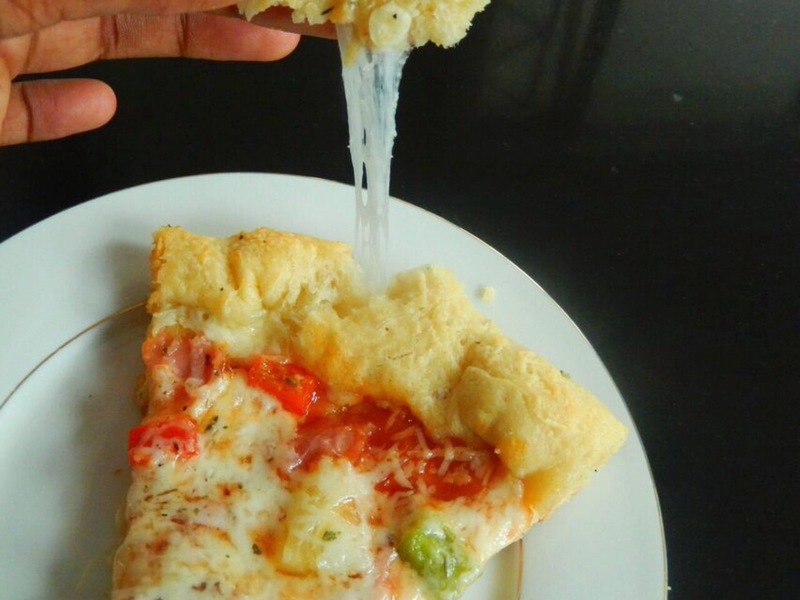 Stuffed crust has always been a weakness of mine, and I just could not resist the urge to sneak a few pieces of mozzarella into the crust of this delectable masterpiece. I would definitely recommend this homemade pizza dough recipe I stuck at the bottom of this page that uses yeast, but you could totally go for this recipe that doesn’t use yeast, or just buy the dough if you’re not feeling up to the whole kneading and mixing and proofing that comes from dough making. But if there is one thing I can guarantee you, it’s that there is no pizza like a homemade pizza. And that is a guarantee. 1. Preheat your oven to 225 degrees Celsius, you are going to want to make sure your oven is HOT when the pizza goes in. Heat a skillet on high heat and fry the bacon until crispy, about 4 minutes on each side. Drain on paper towels and tear into small pieces using your hands. 4. 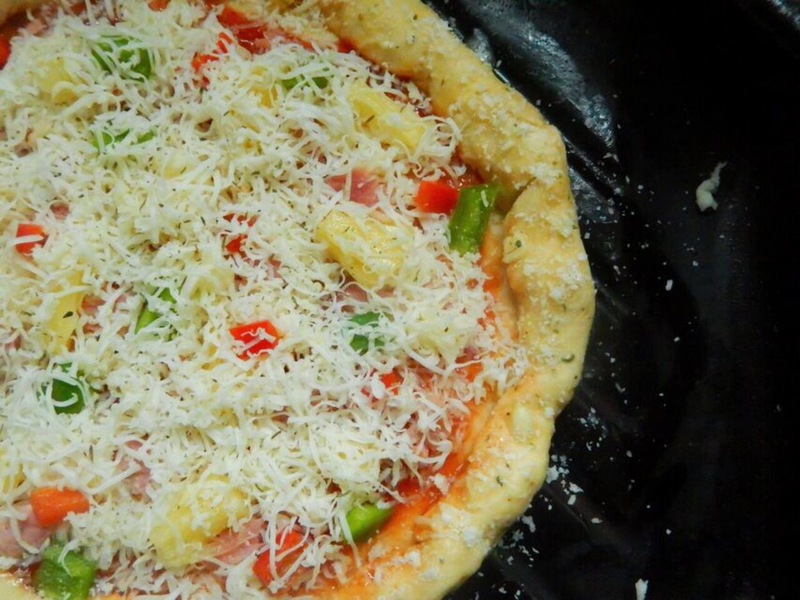 Combine the ingredients for the garlic butter brush in a small bowl, and using a pastry brush, carefully apply the garlic butter to the whole of the pizza, paying special attention to the crust. 5. 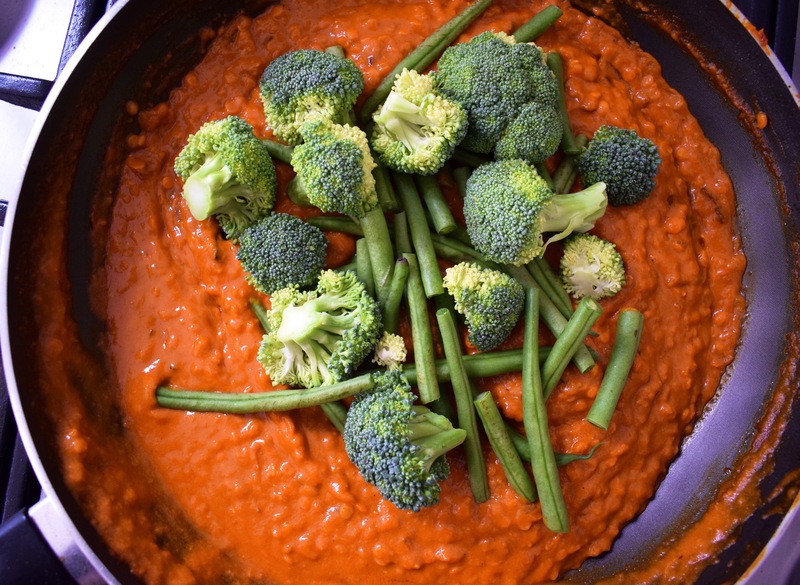 Add the ingredients for the sauce together in a small bowl and spread the sauce over the inner circle. 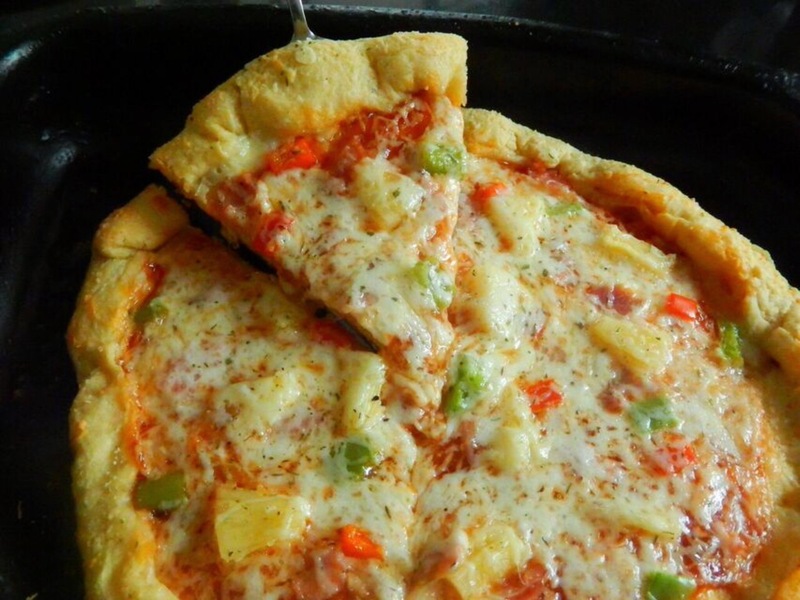 Top with 1 cup of mozzarella cheese, distribute the diced pineapple, crumbled bacon and diced peppers. If you’d like, you can drizzle some barbecue/chilli sauce over the base at this stage before topping with the other half cup of mozzarella cheese. If you feel like being fancy, you can sprinkle the grated parmesan carefully over the crust. Hey there, welcome, bienvenue and thank you for visiting my blog! What I have for you here is golden. Pure gold. It’s even written here in the crunchy spicy coating on this delectable chicken. The first time I fell in love was at the tender age of 8. And that was the day I first had chicken nuggets. Every week I would beg my mother to purchase more of the frozen goodness that was the ray of sunshine in my life. And then all too soon, my world was plunged into darkness when the company closed down and chicken nuggets vanished from my life. I still remember them: a crunchy coating with a tender inside and just the right combination of spice on your taste buds. 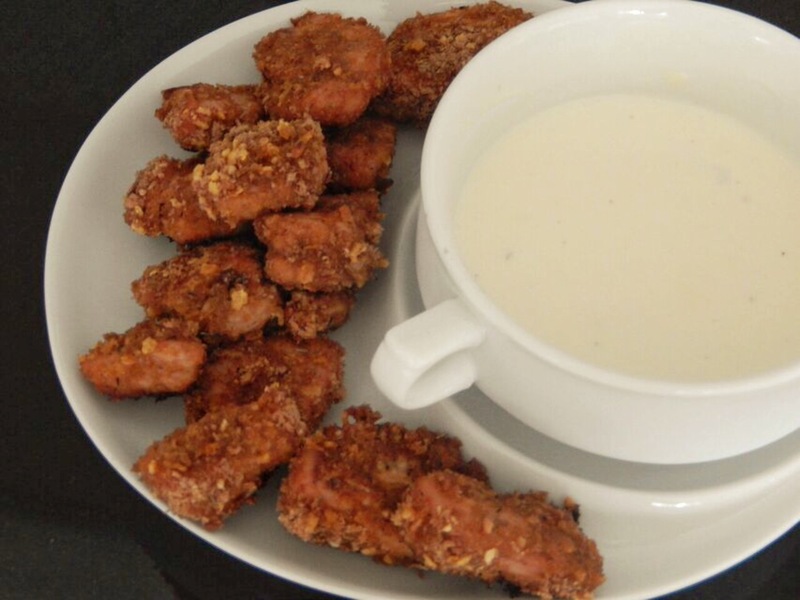 That is exactly what I went for when making these nuggets. Yes, it is. If the coating makes you a bit nervous, you can leave it out and bake the chicken in the sweet and sour sauce, no problem (great chicken, just without the crunchy goodness). Worried about the spicy bit? 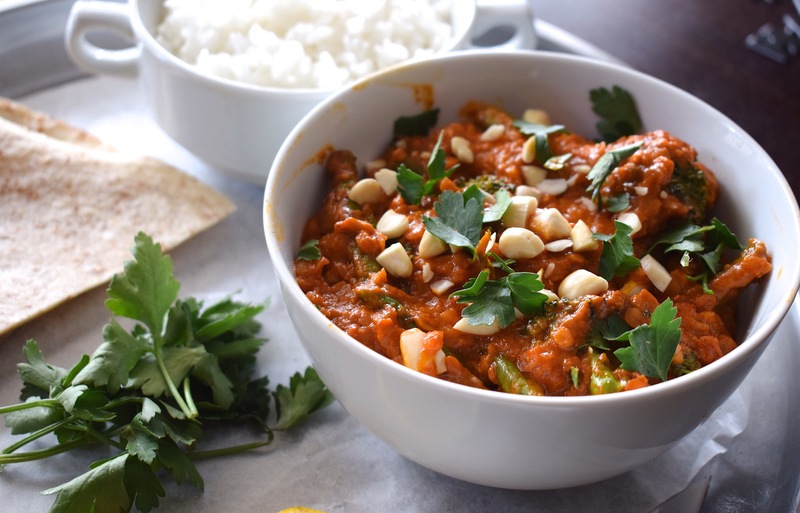 You can always choose to reduce the amount of chilli you add, it’s all about catering to your taste. 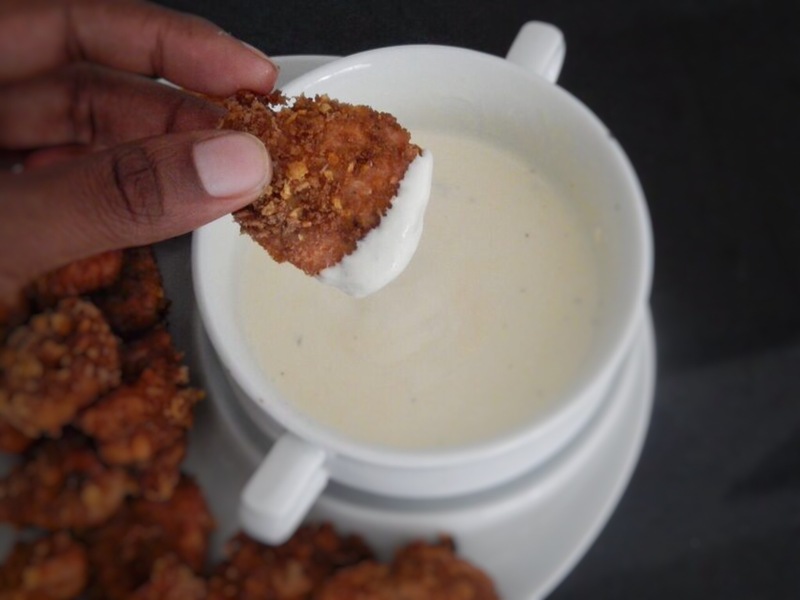 I like to serve this with a ranch dressing dip, recipe adapted from Spoon Fork Bacon, under their recipe for these stellar Chicken Fried Potatoes, calling them amazing would be an understatement. Combine all the ingredients for the ranch dressing in a small bowl and store in the refrigerator until needed later. Toast the bread for 5 minutes in a toaster and let cool at room temperature. 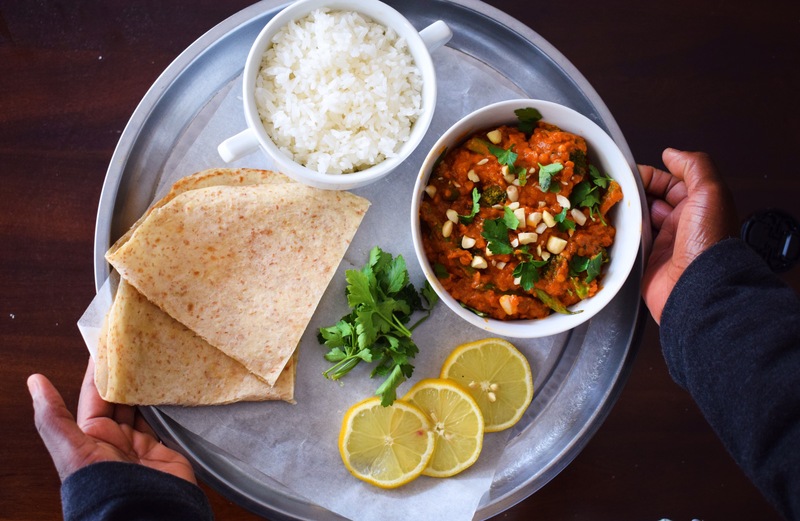 Combine all the ingredients for the chicken marinade together in a small bowl and let sit at room temperature whilst you prepare the coating or for a period of 20 minutes if you decide not to make the coating. Tear the bread into fairly small chunks using your hands, and add to a food processor along with the cornflakes. Blend until both the bread and cornflakes have been reduced to crumbs. Add the mixed herbs and stir until combined. Preheat your oven to 180°C and line a 9×13 inch roasting pan with aluminium foil. 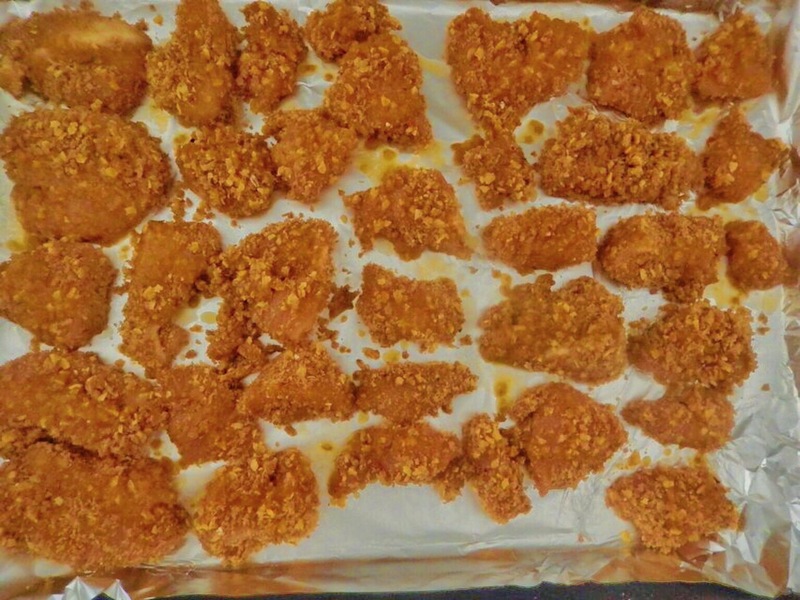 Remove a piece of chicken from the marinade and press into the breadcrumb/cornflake mixture, making sure that the entire chicken piece is coated in the mixture. Place in the roasting pan. 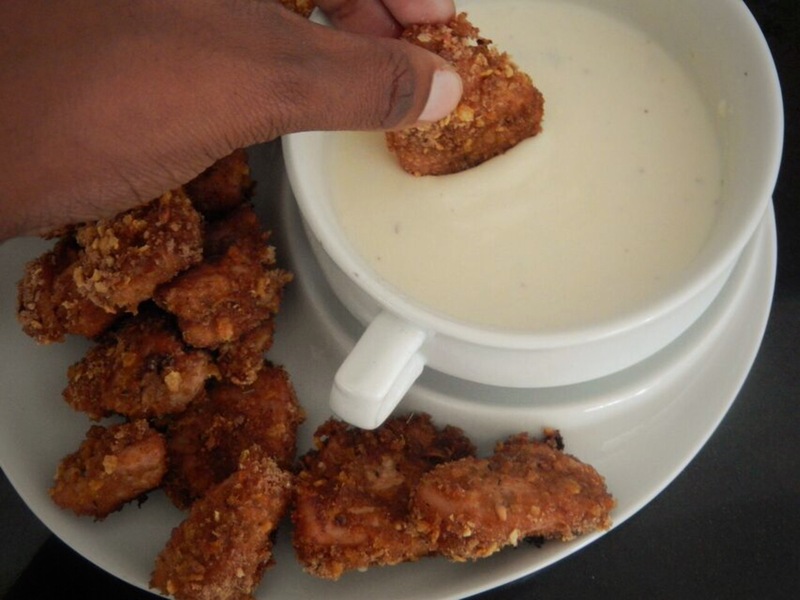 Repeat until all the chicken pieces are coated. Pour the butter and any residual marinade over the chicken pieces and bake 15 minutes, turn once, then bake a further ten minutes. Remove from oven and serve immediately (with ranch dressing). Now THIS speaks to my soul.